The Gorgeous Endurance 720 LRC Skylounge boasts three staterooms and three ensuite heads, crew quarters, and an expansive skylounge. This 720 also has two day heads, one on the main deck and the second in the skylounge area. With ample social areas and formal dining for up to eight, the Endurance 720 LRC Skylounge will take you and your guests wherever you voyage in style and in luxurious comfort. Molded fiberglass full-width boarding step W /movable stainless safety rails. A water tight storage area to Port and Starboard built into the stair walls. Aft deck settee with custom teak table with ebony, holly & rosewood compass rose inlay. Refrigerator built into the aft deck table base. Stainless steel anchor roller, stanchions, cleats, chocks and oval hand rails. The skylounge on the Endurance 720 is very spacious and can be used as a second informal salon. The expansive space offers plenty area for guests to relax when you are cruising.It is equipped with a large pop up TV, day head, refrigeration for drink storage and great sight lines for the visual joy of the cruise. You will find plenty of storage under the seats, in the cabinets and in the aft deck bar/ BBQ area. The Sky Lounge can be accessed either from the aft deck molded in teak covered stairs or via the inside stairs from the pilothouse. The skyounge offers a centered helm station with Garmin 8622 series navigational equipment, 3 X Llebroc power helm chairs, as well as a very large cruising settee with table. There is plenty of room aft of the enclosed Sky Lounge on the boat deck for your tender and toys. It is equipped with a 1600 lb. Brower Davit system with a remote control . Hardtop with LED lighting & three (3) skylights hatches w/screens and night shades. Stairway starboard side leading to the country kitchen and formal dinning area and wet bar. Stainless folding ladder for access to the top of hardtop. A water tight starboard side door for access to the upper Portuguese bridge forward. Aft control stations port & starboard for the engines and hydraulic thruster controls. A convertible forward or aft facing seat with table. 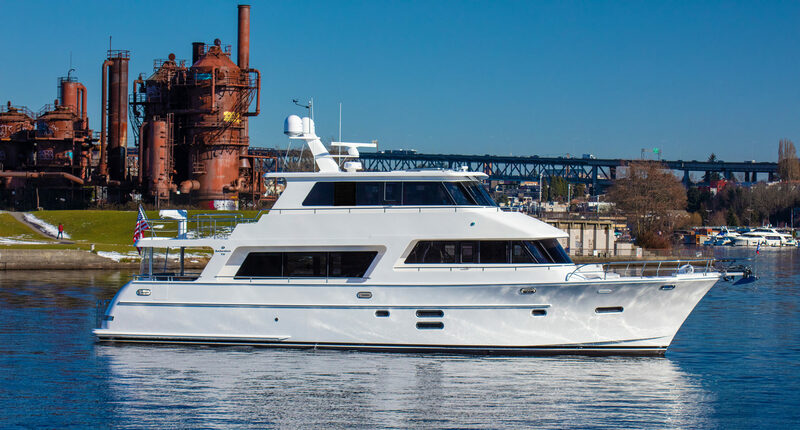 Accommodations aboard the Endurance 720 begin with a well-designed and executed 3 stateroom, 3 head arrangement plus crew accommodations aft with head and shower and small galley area. The entire yacht is build of handcrafted cherry cabinets in a traditional satin finished "raised panel style" with "booked matched" accents. The "Full Beam Owners stateroom" is located midships and features a king-size bed with custom mattress, a walk-in closet, two additional hanging lockers, an ensuite head with granite counters and heated granite floors. The floors can be heated by the hydronic heating system. A large quiet flush Tecma head and a large walk-in shower finish off the elegant large master head. A built in dressing table is to port and several cabinets for storage are built in to port. The king-size bed is equipped with night stands, mirrored headboard and large built-in drawers. A large screen TV, built in stereo, DVD player and anchor watch depth finder finish off the space. GE Profile Ceramic Four (4) burner cooktop, Induction style. The aft guest quarters/crew area can be accessed through either the main salon or from the transom watertight stainless steel door. The area offers the guest stateroom with a double and single bed, a head with stall shower, a work bench, storage and walk-in access to the engine room. The propulsion power for the E720 is provided by a pair of Caterpillar C18 1136HP diesel engines that are coupled to ZF transmissions that are housed in a full stand up engine room. The vessel is also equipped with ABT Zero Speed stabilizer system and ABT hydraulic bow & stern thrusters. The E720 electrical systems are 250/125V/50A & 24/12VDC. Power is supplied by either the dual aft GlenDenning Cable master systems, the Starboard dual 50A or 30A power inlets, the dual Onan generators or from the MagnaSine 4kw inverter/charger. All of the incoming electrical power is managed through the vessels AC/DC distribution panels that are located in the pilothouse. Pre-wire for microwave in crew quarter. Maxwell 3500 dual gypsy horizontal windlass w 300' of chain on each side. Sound Down white powder coated panels for engine room. Wood landing at bottom of stair and around compass rose. Wood landing for forward VIP stateroom. Wood landing for port guest stateroom. Wood landing in front of washer and dryer. © Hampton Yacht Group LLC. All Rights Reserved.